Kuchen is just a basic coffeecake. 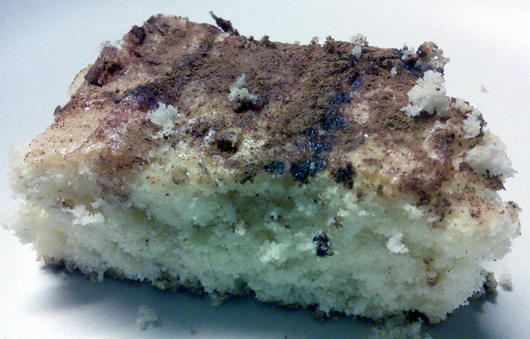 A simple white cake, rather dense and a bit dried, with a "streusel" topping made of sugar and cinnamon. I grew up eating it. It's fairly easy to make with all ingredients you have at home. For my family, this was a typical treat to drink with tea in the afternoon. We always referred to it as "kujen", the Spanish transliteration of "kuchen" which means just "cake" in German. I ate it so often as a child, that I stopped liking it. Probably for that reason, I've never made it as an adult - but I thought it was only fitting that I make it as part of my German-American culinary journey. The recipe I used is my grandmother's. It came to me via my aunt's old recipe notebook. Granny was born in Albany, NY of a German father and a German-American mother. She died when I was nine, so I can't ask her if she in turned got this recipe from her own mother, but I like to think she did. Of couse, they must have done all the mixing by hand, which is not too hard if you keep the butter at room temperature. My aunt's recipe didn't say how long to cook this for, so I experimented. I ended up cooking my kuchen for 40', but I used a pyrex glass pan - it may take less time using a metal cake pan. Start checking after 30'. Preheat oven to 350F. Grease a 13" x 9" cake pan. Using a mixer, cream the butter and 1 cup of sugar together. Mix in the eggs. In a separate bowl, sift the flour, baking powder, salt and nutmeg together. Gradually add the flour to the sugar mixture, alternating with a scant 3/4 cup of milk. Pour batter onto prepared pan and spread evenly. Sprinkle with milk and then with sugar and cinnamon. Bake for 40' or until done. Adapted from my grandmother's recipe.